After undocking from the orbiting lab at 11:55 p.m. EDT Sunday, pilot Greg Johnson flew Endeavour on a 360-degree flyaround of the station, then sent the shuttle on a looping trajectory more than 5 miles above and behind the station. A series of thruster firings next propelled the ship back toward the outpost, approaching from behind and below as a laser system fired pulses 30 times per second to compute range and bearing data. The shuttle halted its approach 950 feet below the station, then burned its jets again to exit the lab's vicinity as Endeavour's crew began preparations for their return to Earth early Wednesday. "Over the past year and a half, it's been a pleasure to work with the hardware and software developers for STORRM," radioed Drew Feustel, the astronaut charged with monitoring the experiment. Endeavour commander Mark Kelly and pilot Greg Johnson oversaw the jet firings from the shuttle's flight deck. "Everybody did a great job in getting the components ready for the flight, and we look forward to continued developments of this hardware and software and hope that it contributes to the development of future vehicles," Feustel said after the STORRM demo was complete. "It's been an honor and a privilege for the crew of Endeavour." Endeavour faded from view in the space station's cameras around 5 a.m. EDT. "The word I'd use to sum it up is pretty much flawless," said Gary Horlacher, the lead flight director for Endeavour's mission. The second approach, called a re-rendezvous in NASA parlance, capped Endeavour's 12-day stay at the space station, which added a $2 billion particle physics experiment named the Alpha Magnetic Spectrometer, delivered a platform full of spare parts and helped maintain the lab's finicky oxygen generation and carbon dioxide scrubbing systems. Called STORRM, the experiment's objective was to try out a high-tech laser navigation system that NASA could use on future voyages to the space station and beyond. STORRM stands for Sensor Test for Orion Relative Navigation Risk Mitigation. NASA tapped Endeavour to take the sensor on a test run. The shuttle flew back to the space station on a unique trajectory designed to mimic how an Orion spacecraft would approach the complex. "People don't understand there are several different ways to approach the station and rendezvous," said John Karas, vice president and general manager of human spaceflight at Lockheed Martin Corp., Orion's prime contractor. 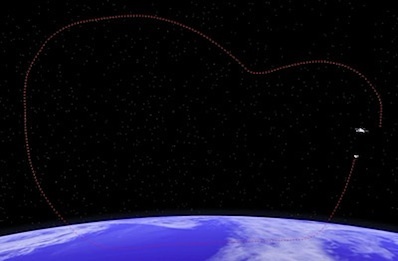 "We're using the set of trajectories specifically designed if we were at the moon or asteroids. We're going to be flying that exact trajectory with those sensors. It's not just the sensors we're testing." The Orion capsule, also known as the multi-purpose crew vehicle, could use the laser sensor to guide itself to destinations across the solar system, ranging from the space station 200 miles from Earth to asteroids millions of miles away. The Orion spacecraft was part of the Constellation moon program terminated by the White House last year. But lawmakers passed a NASA authorization act directing the agency to start development of an interplanetary spacecraft and to base the design on Orion, in which NASA has invested $5 billion since 2006. NASA officially announced May 24 the new MPCV deep space capsule will be based on the Orion design. Heather Hinkel, STORRM's principal investigator, said the laser sensor worked as expected throughout Endeavour's undocking and second approach. A high-definition docking camera, a secondary sensor in the STORRM demo, was sidelined by a faulty data recorder. Both sensors worked perfectly during Endeavour's docking with the space station May 18, and engineers captured the lion's share of the data they needed from the docking camera, Hinkel said. Officials said they will continue analyzing data from the STORRM experiment, and workers expect to remove the sensors from the shuttle's payload bay about a week after landing. After some initial testing at the Kennedy Space Center, the laser and docking camera will be shipped to a Lockheed Martin docking simulation facility in Denver. Embedded in the bedrock of the Front Range of the Rocky Mountains, the new facility will host ground demonstrations of STORRM with a full-scale model of the space station docking system and against a backdrop resembling the surface of a rocky asteroid. Engineers will mount the laser emitter on a mobile platform that can move in and out, side to side and up and down to simulate a spacecraft docking or rendezvous with an asteroid. On one end of the massive facility, a replica of the front of the space station stands ready for testing. A mold of an asteroid surface sits on the other side of the simulator. "We're just showing the versatility of the technology we're developing," Karas said. "We're testing in the environment it's going to be in when we go explore." Although the space shuttle's STORRM test used strategically-positioned mirrors, the system could track targets without reflectors. 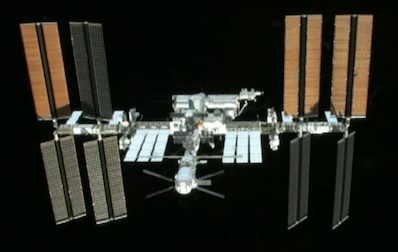 STORRM's data from the Endeavour's docking showed it could generate a three-dimensional representation of the space station even without the help of markings and reflectors, Hinkel said. "Our sensor is good enough to pick out details if the spacecraft is spinning or if it doesn't have any feedback to it," Karas said in an interview. "This sensor can actually track it and pick out reference points. So that actually works well for asteroids with formation-flying. This sensor is really one size fits all. It can do a whole bunch of missions." Scientists from the robotic OSIRIS-REx asteroid explorer selected by NASA last week already contacted STORRM engineers about using a similar laser sensor when it launches to an asteroid in 2016, Hinkel said. OSIRIS-REx will study a nearby asteroid and return samples to Earth. It's a potential stepping stone to manned expeditions. During Monday's test, STORRM's laser fired 30 pulses per second at reflectors positioned on the space station, precisely measuring the time it took the signals to bounce back to the sensor to create a 3D map of the complex. The laser pulses are invisible to the human eye, making the vision navigation sensor an ideal candidate for use on manned voyages. "You could use this for imaging or hazard avoidance for performing landings. There's very broad application for this technology," Hinkel said. "This has very valid application for any space vehicle trying to perform the function of rendezvous and docking either with another vehicle or trying to land on a surface." Hinkel said early looks at the data show the laser sensor acquired the space station beyond its design goal of 5 kilometers during docking May 18 and in Monday morning's test. STORRM collected nearly 600 gigabytes of data throughout the mission, according to Hinkel. The laser instrument and docking camera were built by Ball Aerospace & Technologies Corp. in Boulder, Colo.
STORRM's data was recorded by an on-board computer and didn't play an active role in Endeavour's re-rendezvous. The shuttle used its own laser rangefinder and radar systems throughout Monday's activities. "We have a lot of good data analysis days coming ahead of us once we get the boxes off the vehicle in Florida," Hinkel said. "And the team will start working together to analyze that data." 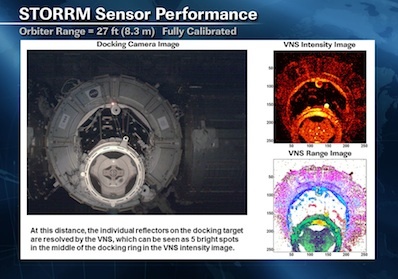 Engineers hope the STORRM test proves the sensors are nearly ready to be operational, but there's still work to be done developing software algorithms to tie the laser and docking camera into Orion's guidance computer. The ultimate objective is to use the system for automatic dockings. Russian Soyuz spacecraft and Progress cargo freighters use a rendezvous radar for automated dockings at the space station, and Europe's Automated Transfer Vehicle uses a vision-based laser system similar to STORRM for its autopilot approach. "All spaceflight hardware gets designed on the ground and tested to the best we can, but you can't really simulate the entire space environment here," Horlacher said before Endeavour's mission. "Until you get into orbit, there's only so far we can take it."